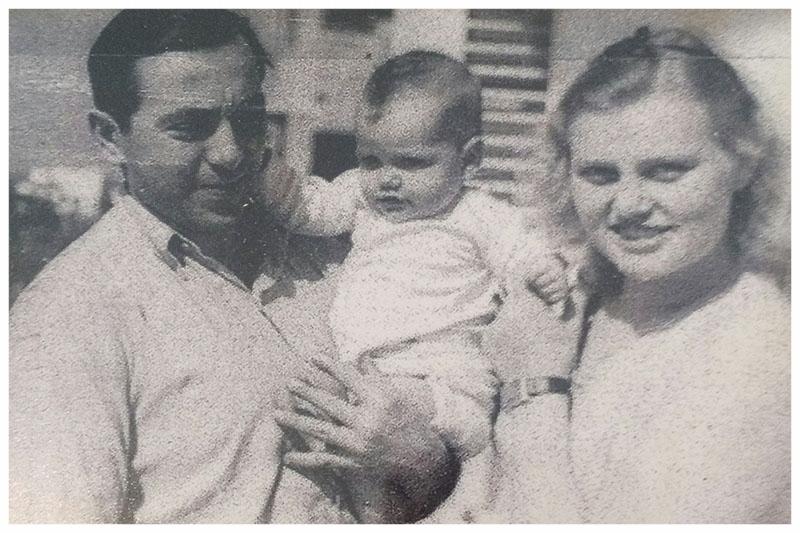 In 1942 – my mother’s life changed. With the promise of a better life, she and her older sister were forced to board a train to the Theresienstadt concentration camp. Elizabeth Herrlich was born in Opava, Czechoslovakia. Her father – Heinrich Herrlich - was a successful verterinarian, who lived there his entire life. Her mother – Marta Dworak – arrived in Opava from Graz Austria. A convert to Judaism. Their life was traditional, ordinary and comfortable. She and her siblings were educated in schools open to the public. Their house was in the center of town across from the Statdpark (town park) and synagogue. One miserable, cold, wet slushy day, on 15 March 1939 – the German s arrived in their quiet town. Panzer tanks and troops came marching through, desecrating their graves. On the following day – their father was arrested, synagogues were burned, businesses were destroyed. They were forbidden to attend school, restricted from their daily activities, and forced to wear a yellow star. In the years 1939 – 1941, their father was arrested many times, and always, and luckily, returned to them. In 1941, it was announced that the Jews were going to be relocated to a safer more protected town. Transports were always described as a promise and a trip to a new and better life. Tati (my mother’s nick-name) and her older sister were the first to go. They boarded their trains with hope, dressed in their best clothes with baskets of home baked breads and cookies, looking forward to their new life’s adventure. My mother was 14 years old. On the train, they were assigned a number. From there after, they were never referred to again by their given names. Their destination: Terezin. After days of overcrowded, uncomfortable travel – they arrived at a train station. 20 km from Terezin – they were marched with dogs snapping and guards shouting insults. Words like Scheisse Schnell and Schweinedhunde and Judenpack are words she’ll never forget. All who arrived were assigned a work. Tati was sent to the kitchen where she scrubbed floors and managed to collect scraps of food which she shared with the others. And it was in this first camp where she first found love. Kurt Peter Heller was an 18-year old cellist who delivered food to the kitchen. He found her crying in the square while looking out at an old fountain. He wiped her tears and the two of them found a bit of happiness in and among the human misery. Every day there were transports. They claimed that the camp was overcrowded and that they needed to move people elsewhere to accomodate the VIP’s. The team in charge of cleaning empty wagons learned of the ‘final solution’. Messages scratched in the wooden benches revealed the destinations to be Birkenau and Auschwitz. Their love was short-lived. In 1944, when Tati learned that Kurt was being sent to another camp (Birkenau), she volunteered for the next transport in hopes that she might find him there. Ani Ma-amin. Ani Ma-amin. Ani Ma-amin. She never gave up hope, and dreamed of someday re-uniting with loved ones. There were 50 people packed into a small cattle transport. It was nothing but a metal box with wheels. They sat on the floor. They were fed sporadically and occasionally allowed to use a toilet at various rest stops along the way. They headed east through Czechoslovakia , crossing Silesia and into the farthest reaches of Poland. The landscape was desolate, bare and grey. They entered the gates of their final destination. ‘Arbeit Macht Frei’, greeted them along with vicious dogs, shouting SS officers and the screams of those who were being tortured and terrified. Quite miraculously, she survived. She was among those who emerged from the showers – shaved and emaciated. De-humanized. In early 1945 – she and 100 other girls were moved to Merzdorfin the vicinity of Breslau, Poland. It was a labor camp not that different than Auschwitz, but that they worked out in the fields and open air. They worked to remove rubbish from air raids. Day and night. Night and day. In April 1945 – Merzdorf was liberated by the Russian army. After the war, my mother returned to Czechoslovakia. It was there that she met my father. They married in 1947, emigrated to Cuba in 1948. I was born en-route – in Paris of 1948. She’s shared with me the hope that comes with the birth of a child. For her – I was that hope and promise of a new life. My mother - Tati- is now 92 years old. Alive and well, she lives in Geneva, Switzerland. Everyday we talk via skype. My mother, sister and I - today. And now – after so many years of not knowing – I’m sharing her story.